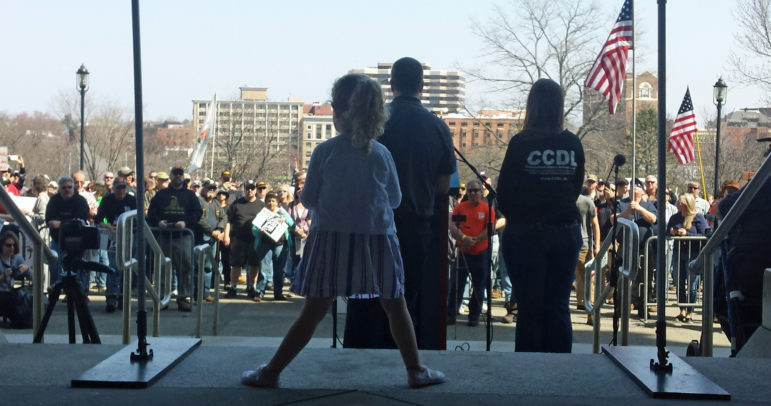 A young girl stands at the steps of the State Capitol in Hartford as nearly 2,000 pro-gun advocates are gathered. Bearing banners, placards and American flags, hundreds of gun-ownership and Second Amendment supporters gathered in front of the State Capitol in Hartford Saturday, protesting gun-control and anti-gun legislation here and elsewhere nationwide. The rally, organized by the Connecticut Citizens Defense League, a gun rights advocacy group, was in response to gun-control sentiment and the backlash against gun-rights groups in the wake of the Parkland, Fla., high school shooting in February, CCDL event coordinator Holly Sullivan said. In what Sullivan described as a “healthy turnout,” a crowd estimated at nearly 2,000 people gathered on the capitol lawn, many of them bearing American flags, colonial flags, and Gadsden “Don’t tread on me” banners. Pipe and cigar smoke wafted. Members of the crowd, mostly men, mostly white, chatted among themselves about the turnout. Some carried pistols at their sides, never removing them, but leaving them in sight. Attendants at a station handed out water. People took photos of one another, smiling and holding up signs. Some brought their families; children sat on picnic blankets, playing Minecraft on iPads, or simply watching the crowd intensely. 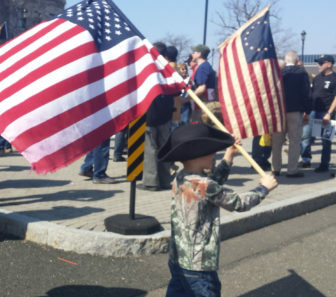 A boy at Saturday’s Second Amendment rally in Hartford. A young boy in a colonial patriot hat and clad in a camo shirt walked by waving an American flag. 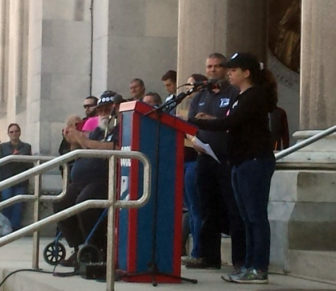 From the Capitol steps, CCDL president Scott Wilson led the proceedings, calling for attendants to “join the battle” against anti-gun legislation in Connecticut. It was the first CCDL rally since 2014. NRA spokesperson Catherine Mortensen, from Washington, D.C., was a keynote speaker, railing against recent legislation to ban bump stocks, other such accessories, and so-called “ghost guns,” which allow for the assembly of untraceable firearms from kits bought online. A bill to ban bump stocks in Connecticut was recently approved 36-5 by the Judiciary Committee, moving the issue to a vote later this year. “Some [legislators] want to ban something that’s not even a problem,” Mortensen said, in reference to the ghost guns. “[Banning] bump stocks would criminalize law-abiding citizens,” she added. Mortensen all cited the continued “attacks” on gun rights by the media and interest groups. 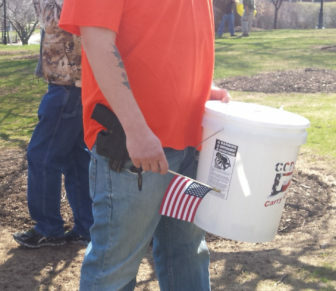 A man at Saturday’s rally wearing his sidearm. “Emboldened by the mainstream media, the lobbyists are no longer distancing themselves from repealing the Second Amendment,” Mortensen said. Mortensen said that gun control is not the solution to decreasing school shootings and gun violence, and instead emphasized better mental health care and improved school security, referencing Washington’s recently passed Stop School Violence Act, which would fund training and resources for teachers and students to detect early signs of threats. Mortensen also criticized Gov. Dannel Malloy’s comment last month that the NRA is a “terrorist organization.” The spokesperson said that such actions were “attempts to demonize” the NRA and law-abiding gun owners. “[They] will not scare us,” she said. A hot topic for both the speakers, and the rally as a whole, was the recent decision by the Aqua Turf in Southington to refuse to host the annual NRA fundraising banquet. Local gun-violence prevention groups had called on schools to cancel proms scheduled for the facility until they did so. State Rep. Doug Dubitsky (R-Chaplin) labelled the move an example of “economic terrorism” and an act of “fascism” from special interest groups. The Hartford rally comes one month after the nationwide walkouts orchestrated by high school students calling for universal background checks, bans on assault rifles and remembrance of school shootings in Parkland, Newtown and other American communities. Ashley Dummit at the podium. Not all students supported this movement, however. One who didn’t was Ashley Dummit, 16, a Farmington High School student who protested against a walkout at her high school, and instead successfully pushed for it to be replaced with an assembly, according to CT News Junkie. Dummitt spoke at the rally, drawing cheers from the crowd. Held simultaneously with the CCDL rally was the second Hartford March for Science, which drew a few dozen protesters to Minuteman Park at noon on Saturday. Though last year’s march drew “a couple of thousand people,” event coordinator Stephanie Kexel, a professor of environmental sciences, said this year’s lower turnout was due to the late organization of the event, and other rallies occurring throughout the year. Back at CCDL’s rally however, Dubitsky addressed a crowd of hundreds.